Dr. Katerina Gallus and Dr. Trent Douglas discuss what to expect after breast augmentation surgery and how to optimize your recovery. And we’re going to talk about recovery from breast augmentation surgery. When you’re planning your recovery from breast augmentation, there are a few important considerations. First of all, you’re going to need help around the house for about two weeks after surgery. Especially if you have young children. You are going to wear a compression garment after surgery for about four to six weeks. That means that you shouldn’t plan bra shopping for at least six weeks after surgery. Your recovery is going to take a little bit of time, so if you’re a very active person, no upper body workouts or heavy lifting for the first four to six weeks after surgery. At Restore SD Plastic Surgery, we offer a minimal opioid plan to reduce the amount of narcotics that you would take after surgery. This is very effective in not only helping with the national opioid crisis, but also giving you the most comfortable and favorable recovery possible. 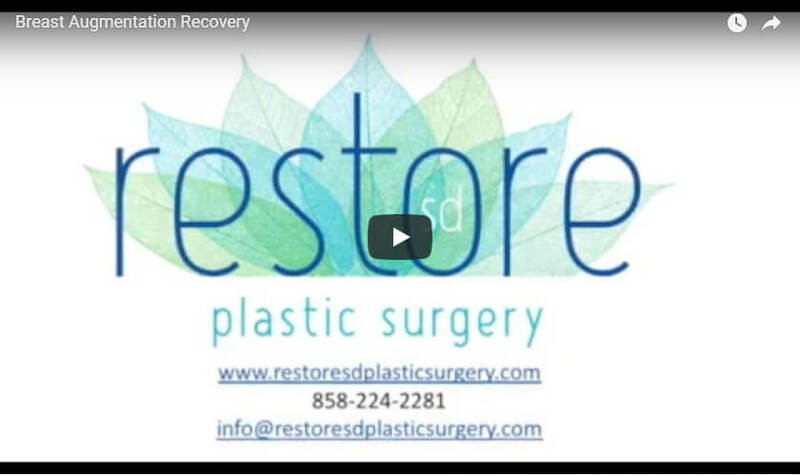 Please come see us at Restore SD Plastic Surgery to discuss your breast augmentation surgery and your recovery plan. We look forward to seeing you here at Restore SD Plastic Surgery.